This post, Defy Expectations is about a great album that has been overlooked or disregarded because it is not what people have come to expect musicians in general, but this article is about Kanye West. I have been listening to some new music, but this is something that I was thinking about roughly a year ago because of Kanye West’s 808′s and Heartbreak. This will be an ongoing article that focuses on albums that ignore the demands of mainstream culture and focus on music. I didn't make my way to this album until last summer, but the album was released in 2008. If you can look past the ego Kanye projects, you will see that it's creative, explores a new musical tool and morphs hip hop into his own complete vision. Let me be the first to apologize for being shocked by this album. I couldn't figure out how to approach 808′s and Heartbreak. I thought the guy had lost his damn mind when I saw Love Lockdown, his first video from the album. The sound was so different than what I came to expect from Kanye, it shocked everyone (myself included). The shock is exaggerated because when tracks from this album are presented as singles, they stand out and seem odd with the latest club anthems acting as bookends. It made it even harder to understand where Kanye was heading with Love Lockdown because the video is so visually striking and beautiful, but somewhat contrary to the vibe of the music. 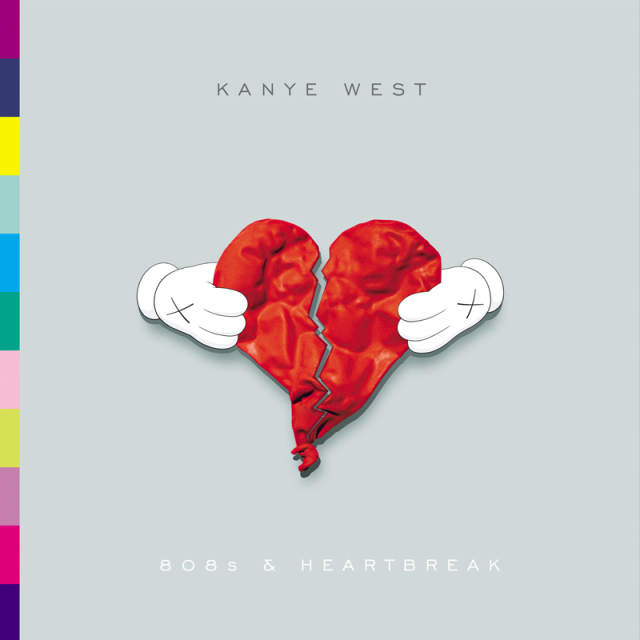 I think all of the songs on 808′s and Hearbreak NEED to be experienced in sequence of the album. The album creates a world and I think it helps to not jump in and out the way the radio/videos does. The only thing you need is attention span and about 30-45 minutes. So forget everything that you have heard from Kanye before or after this album. Or if you have only heard the singles, forget what you know about them. Forget that he is a gifted producer and a witty lyricist. And definitely forget his newest album that is widely praised by the media. If you listen to this album from beginning to end, I think it makes it much easier to appreciate Kanye West as an artist. Once you do, I think its clear that that this album does what no hip hop album has done before and Kanye did it with the demonized AutoTune. 808′s and Hearbreak is produced completely in AutoTune. All of his lyrics, whether rapped or sung, are AutoTune. I typically don't like music with AutoTune, but 808's & Heartbreak is definitely an exception. The Top 40′s are filled with soulless AutoTune songs that probably take about 10 minutes to write, if they write them at all. Before, if I heard anything with AutoTune, I would reach for the power button. I remember having a lot of respect for Jay Z calling people out for using AutoTune in his Death to AutoTune track. Kanye won that war with this album (while using the tool that Jay criticized) and he does it on Jay Z's label. Even if you don't think Kanye is the type of person you want to support, you have to admit that his music is G.O.O.D. Music. Back to 808′s and Heartbreak……The sounds are electronic while some of the beats are more tribal and rooted in African drums. That being said, the video for Love Lockdown makes more sense. Kanye has mixed African drums before, so it isn’t anything new from Kanye. Just look back to songs like Slow Jamz with Jaime Foxx. In 808's & Heartbreak, the contrast of the minimal electronic keys with the hard tribal drums creates a completely new sound for hip hop. 808′s and Heartbreak focuses on relationships, but something tells me that this album is actually about more than that. Everyone knows that Kanye was really close with his mother. I get the feeling that certain songs are symbolic about the loss of his mother an the dynamic between them. At the end of the album, there is a live performance where you can hear him almost break down from being emotional. There are some insecure people that can’t handle songs that deal with emotion. On this album, he manages to defy backpackers, the mainstream, his record label and just about everyone else. The resulting effect is Kanye West being the most successful anti-hero in pop culture today. He is arrogant but it doesn’t matter because his music demands respect. His arrogance makes his way into this lyrics all of the time, but if you can appreciate him as an anti-hero, it will help stomach the ego and make you laugh at how extreme his lyrics are. Kanye and other artists like Eminem bask in controversy and it is what keeps people coming for more. Welcome to Hearbreak. This song starts out with some moody strings, deep bass and then breaks into the beat, which lightens up the song. Also, there are keys that flow through the song and the snare is echoed and distorted a little, but the sound is still clean. In the end, I would say that this album is one of the best albums in the past 5 years. Kanye loves to be the bad guy and he's pretty good at it. So, take a second to listen to this album and let me know what you think. Say You Will, Welcome to Heartbreak, Heartless, Amazing, Love Lockdown, Paranoid, Street Lights, Bad News, See You in My Nightmares, Coldest Winter, Untitled (Live Performance).